Associated Press reported that a Norwegian court sentenced Anders Behring Breivik to prison in late August 2012, denying prosecutors the insanity ruling. Prosecutors wanted Breivik to be declared insane to establish a massacre in Norway on July 22, 2011 as the work of a psychotic mass murderer, rather than an anti-Muslim crusade. Prosecutors argued Breivik was insane as he plotted his attacks. 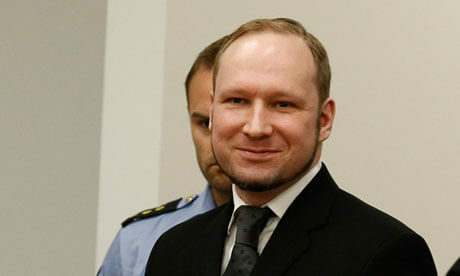 Breivik smiled with seeming satisfaction when the judge read the ruling. When Breivik heard his sentence, he raised a clenched-fist salute. The ruling declared Breivik sane enough to be held criminally responsible and sentenced him to “preventive detention.” Preventive detention means Breivik is not likely to ever be released. Breivik’s lawyers stated prior to the ruling that he would not appeal any ruling that did not declare him insane. In Norway, Breivik bombed and gunned 77 people. Eight people died and more than 200 were injured by the explosion. Breivik, age 33, got what he wanted from the ruling. He did not want to be cast as ill to draw doubt on his political views. The ruling does not picture him as a madman, but a political terrorist. Since his arrest, Breivik has stated the attacks were meant to bring attention to his right-wing ideology and inspire uprising by “militant nationalists” throughout Europe. A five-judge panel in the Oslo district court unanimously convicted Breivik of terrorism and premeditated murder. Premeditated murder means murder that is planned. The court read a 90-page ruling and reviewed the rampage, describing each victim’s injuries. The court ordered him imprisoned rather than sent to an insane asylum. He will be sent to prison for 10 to 21 years, the maximum sentence allowed for the massacre under Norwegian law. The sentences can be extended as long as an inmate is considered too dangerous to be released. Legal experts state Breivik will likely spend the rest of his life in prison. He most likely will be sent to Ila Prison. Breivik confessed to the attacks during the trial, detailing how he detonated a car bomb at the government headquarters in Oslo. Breivik said he acted in defense of Norway by targeting the left-wing political party. He accused the party of betraying Norway with liberal immigration policies. Breivik opened fire at the annual summer camp of the governing Labor Party’s youth wing. Sixty-nine people were killed in the shooting on Utoya island. Most of the victims were teenagers. The police response was slowed by poor communication and technical problems. Police took more than an hour to reach Utoya. A boat carrying the SWAT team was overloaded and would not go in the middle of the lake. Norway’s only police helicopter wasn’t used because its crew was on holiday. The youngest victim was age 14. Norway’s justice minister and police chief resigned after the event. Some critics have asked the prime minister to step down. Breivik’s lawyers reported he started writing sequels to the 1,500-page manifesto he released on the Internet before the attacks. During pretrial detention, he stayed at Ila Prison with access to a computer. In prison, he can communicate with the outside world through mail, but not the Internet. His mail is checked by prison staff to stop mail encouraging illegal acts or the creation of criminal networks. Breivik’s anti-immigration views are shared by others. The violence forced Norway to accept that terror doesn’t arise just from foreign fundamentalists, but can come from within the country. Breivik is the son of a Norwegian diplomat and a nurse who divorced. Prior to the attacks, Breivik had been a law-abiding citizen, except for spray-painting graffiti during his youth. His guilt was not at issue during trial. Breivik’s sanity was the key legal question to be decided by the trial. Two psychiatric teams reached different results. One team gave Breivik a diagnosis of paranoid schizophrenia, a mental illness that would keep him from going to imprisonment. The other team found him narcissistic and dissocial. This means having a complete disregard for others, but criminally sane. The court criticized the team who found him insane. According to the news article, the court reported he had controlled behavior in planning and carrying out his plot.